Bristol Cloth Crowdfunder has been incredible! We raised £7,000 in the first 5 days of the campaign, and received pledges from a global following, with backers including the likes of Orsola De Castro (Founder of Fashion Revolution), eco-chef Tom Hunt, Kathy Hattori (Founder of Botanical Colours), actress Charity Wakefield, singer Nessi Gomes, and so many of our beloved local community. The BBC featured our story in a wonderful 3 minute piece on Points West news, as did several local press including two pieces in Bristol 24/7, Bristol Post and Bristol TV. Prior to launching the campaign we were honoured to see Bristol Cloth written about in detail in the beautiful Selvedge Magazine and ever so inspiring No Serial Number Magazine. See all full articles on Bristol Cloth Press Page. Currently we have raised a whopping £9500 and hope that our target of £15000 can be reached by the end of the campaign on Christmas Day. Please pledge whatever you can afford via the crowdfunder here. We have rewards from £5-£1400 all listed on our crowdfunder for you to choose from. Alternatively you are also welcome to donate any amount you wish to. We also welcome enquiries for wholesale orders from designers and businesses. Please pledge to help back the re-emergence of a local, non-toxic, biological textile industry for the UK and receive your own piece of the Bristol Cloth or choose from the selection of local designer made garments & accessories. The Bristol Cloth project showcases British heritage, preserving what this land has always offered and what British communities have done for centuries. We are set to prove that it is still commercially viable to make cloth on our shores, sustaining British tradition, culture, community, land and the economy. Bristol Cloth is made with holistically farmed and biologically washed wool from Fernhill Farm. Naturally dyed with organic British plant dyes by Botanical Inks. And woven at the Bristol Weaving Mill, the first industrial loom to open in Bristol in 90 years. By supporting this campaign, you can help re-create a local, resilient textile economy in the UK, offering an alternative to the unsustainable global textile production systems which have threatened traditional British cloths almost to extinction and critically damaged the health of our biosphere; Support regenerative agriculture which captures carbon from the air and locks it back into the soil whilst also replenishing soil health; Help recreate our ability to dye textiles using non-toxic plant dyes; promote biological textiles which are safe to use and put back into the earth at the end of their useful life cycle and bring artisan textile production back into our local economy. When the campaign goes live on Wednesday October 24th at 7.30am, please pledge whatever amount you can in exchange for the excellent local designer made products made with Bristol Cloth, including coats, bags, purses, jackets and other accessories, and meterage of cloth for you to make your own items with. Please share this project on social media, to help make it seen as far and wide as possible. The more shares you can help with, the more chance there is of people supporting this project. Below are some ready made social media posts for you to copy and paste onto your profile. @BristolCloth crowd funder launches Oct. 24th - Set to prove that it is still commercially viable to make cloth ecologically on our shores, sustaining British culture, community, land & the economy. By supporting this campaign, you can help re-create a local, resilient textile economy in the South West, offering an alternative to the unsustainable global textile production systems which have threatened traditional British cloths almost to extinction and critically damaged the health of our biosphere; Support regenerative agriculture which captures carbon from the air and locks it back into the soil whilst also replenishing soil health; Help recreate our ability to dye textiles using non-toxic plant dyes; and bring artisan textile production back into our local economy. Bristol Cloth is made with holistically farmed and biologically washed wool from Fernhill Farm. 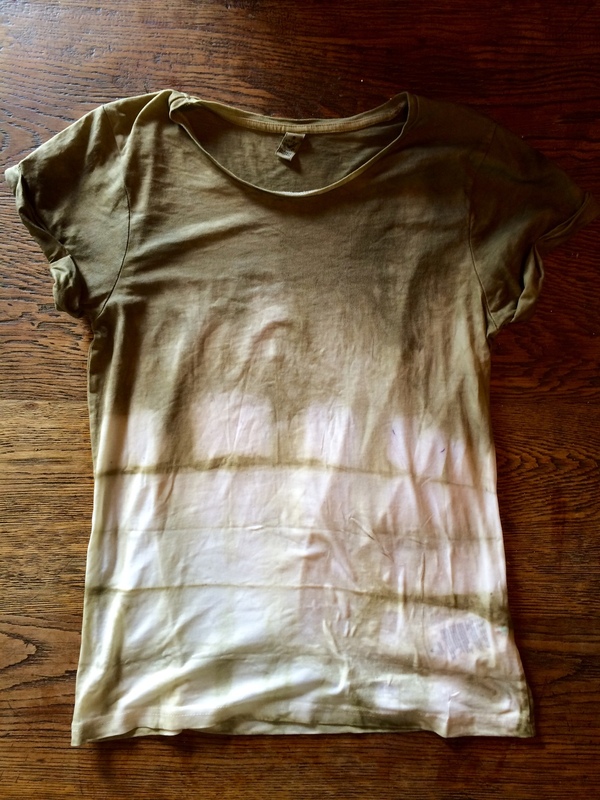 Naturally dyed with organic British plant dyes by Botanical Inks. And woven at the Bristol Weaving Mill, the first industrial loom to open in Bristol in nearly 100 years. @BristolCloth showcases British heritage, preserving what this land has always offered & what our communities have done for centuries. "We are set to prove that its still commercially viable to make cloth on our shores, sustaining British culture, community, land & the economy". @BristolCloth - a thoughtful local textile production system, sustaining heritage British culture, community, economy and regenerating land. I've just landed today in Seattle to mark the Botanical Inks Plant-To-Print Dyes, Techniques and Projects North America/Canada book publication day! The book is now available here in local stores and online! To celebrate I've come to spend a few weeks adventuring into the wilds of Washington, Oregon and California, to explore the landscape, get creative and meet some of the natural dye and Fibershed communities, before heading back to the UK via New York. I'm so excited to be here!! I'l be starting off the adventure at Botanical Colours natural dye studio in Seattle with Kathy Hattori, offering a promotional workshop and book signings, before disappearing into Oregon to hunt for natural hot springs and giant redwoods. See the full list of events below. Do get in touch if you would like to connect while I'm here! I'm so excited to finally be able to show you the Botanical Inks book I've been working on with Quadrille Publishing. It's been a real labour of love; pouring over pages of writing, designing props and making sure it all fits together and flows well. I hope you like it..! Learn how to transform foraged wild plants, plants, garden produce and recycled food into dyes and inks with Botanical Inks. The book shows you how to extract environmentally sustainable colour from the landscape and use it to create natural dyes for textiles, clothing, paper and other materials. Botanical Inks covers dyeing and surface application techniques, including bundle dyeing, Shibori tie-dyeing, hapazome, indigo sugar vat dyeing, wood-block printing, screen printing and more. And it also shows you how to turn your new inks, dyes and technique knowledge into wonderful projects, from a simple bundle-dyed scarf to a block-printed tote bag. Wow, what a ride the past few months have been..! Botanical Inks has seen a bigger Summer workshop tour than ever! This year We held natural dye classes in some incredible places and met so many wonderful people. It was a pleasure to teach at Fashion and Textiles Museum, Vervain Flowers, Plymouth College of Art, Soho Farmhouse, Selvedge Magazine, Babington House, Prema Arts, The Forge, Hawkins Brown, Textiles Hub London, Double Elephant, Thelma Hulbert Gallery and Hawkwood College. So much gratitude goes out to all of our lovely hosts for having us to visit and share the love of natural dyeing! Bringing our artisan crafts to this group of beauties, at their woodland grotto bridal shower was a particularly magical moment. And being invited to exhibit at the Country Homes and Interiors Magazine Summer Show and feature as their Favourite Designer Maker in their latest issue was wonderful! (see below). I was also honoured to be featured in Simple Things magazine and a multiple page spread in Mollie Makes Magazine. Many nice times were shared at the Botanical Inks studio in Bristol, in our more intimate workshops, focusing on screen printing with natural dyes. You may have noticed we have gone a bit quiet on the workshop front over the past few weeks...It's because every bit of energy is now going into creating a special book project with Quadrille Books. More on this to come..! New workshop dates will be announced soon, for the Autumn/Winter season. Check out our facebook, twitter, and instagram pages to stay up to date. You can also sign up for our seasonal newsletters, on our homepage here. As the plant energy now rises back to the Earth's surface, we too, are noticing the energy-levels in our bodies rising. I've enjoyed the first sights of snowdrops, daffodils, croci, and now blossom, appearing around me. This week I harvested wild garlic, to make pesto. So exciting! The herb immediately sends a surge of green energy through my system, clearing out stagnant energy & toxins which have accumulated over the Winter. I feel a cleansing and re-vitalisation in my body, readying me for a new solar cycle. A space for creative projects, product lines, private commissions, 121 training and group workshops. Email to find out more about how we can help with your natural dye projects. We are taking on new commissions now! You'll find us in the Old Market Quarter. A conservation area of national significance, to the east of the city centre. Old market is an ancient market place which developed immediately outside the walls of Bristol Castle, on what was for many centuries, the main road to London. The area contains some of Bristol’s most ancient buildings. Old Market has in recent years become a centre of Bristol’s gay scene, and has been proclaimed as ‘Bristol’s Gay Village'. We are housed inside the Old Market Manor maker-space. Want to know more about natural dyes? Check out our full list of workshops below for the Spring/Summer Season. Our workshops often book up quickly, so book early to avoid disappointment. Bundle Dyeing With Juice Waste from East London Juice Co. The Fashion and Textiles Museum, London. With much love and excitement! I recently enjoyed a brief spell in the outer limits of the British Isles...The Outer Hebrides...Barren, treeless lands, covered with soft heather, moor and lochs. North Uist held us through stormy nights and days of fierce winds and horizontal rain...We were blasted clean of any Summer indulgences, purified with icy sea dips in white sand bays of crystalline turquoise waters, cleansed with seaweed baths..and bakes, nutrified. Calmed with warm fires, hot herbal tea, gentle cheer and cosying.. While many were enjoying the sunshine elsewhere, we were shifting straight into Autumn mode and exploring the natural resources and elements these faraway lands have to offer. Much of the environment and identity of the Outer Hebrides has been shaped by a strong crofting tradition. Small-scale farming practises, seen all over the island of North Uist, and marked out by a series of ‘runrig’ lines, loosely containing sheep and cattle. It's interesting looking into the history of natural textile dyeing in this part of the World. Early Scots, had access to a variety of dyes, sourced directly from the land, which were used to create the impressive range of colours used for traditional tartans. Once known for using local natural dyes by its dyers, has now replaced these with low VOC dyes. However, the only looms used by the weavers are treadle, meaning no electric powered looms are used whatsoever, and everything is done by hand. Interestingly, something else which Harris Tweed do, which unlike many other cloth manufacturers, is dye their wool before being spun. They claim that this allows for a multitude of colours to be seen in the yarn. "With each thread containing a myriad of different colours, a cloth of great depth and complexity is produced." Although somewhat disappointed that Harris no longer use natural dyes for their modern cloth production, I'm overwhelmingly delighted to learn more of the Strathskye Tartan project. A collaboration between Knockando Wool Mill and natural dyers, Shilasdair Yarns on the neighbouring Isle of Skye. "Knockando Woolmill designed and wove the tartan on the restored Victorian Dobcross shuttle loom with the naturally dyed yarns from Shilasdair. The tartan pattern incorporates aspects of the vibrant, natural landscape of both Skye and Strathspey. Blues and greens from the hills, sea and sky accentuated by the red of cresting sunsets and the bright yellow of the freely flowering tansy. One of the characteristics of dyeing from natural materials can be tonal variation within the shade. Although this could be considered a fault in modern dyeing practices, it is a classic hallmark of naturally dyed yarn, adding to its authentic charm. Traditionally woven on a shuttle loom this woolen spun cloth has the all important finished edged to form the hem of the kilt, and is also suitable for other apparel and soft furnishings. The name 'Strathskye' was chosen following a competition, and incorporates both Strathspey and Skye - where the tartan was made, and where the yarn was created." "Yellow is very difficult as the crop is inconsistent from year to year, owing to variations in growing conditions dueespecially to the overall weather pattern for the year. The exact timing of the crop harvest is also important as as this takes place over a period of several weeks and can be affected by local weather conditions in force at the time. For this reason the tansy is supplemented or modified as required by small amounts ofnatural dye extracts or derivatives for exampleweld and marigold." Madder root is used to create the orange/red coloured yarn, sometimes with a little madder extract to improve the consistency. Blue is achieved using indigo, and the green is indigo over-dyed with yellow from tansy, weld and marigold. This naturally dyed Scottish wool tartan is available to buy online for £75 a metre, from here. If you are as excited by this news of a locally dyed and woven cloth as me, you'll probably also be interested in the Bristol Cloth project (pictured below). A collaboration between Botanical Inks, Bristol Textile Quarter, Bristol Weaving Mill and Fernhill Farm, to produce a locally sourced and manufactured cloth here in the South West. Find out more about the Bristol Cloth here and get in touch to register your interest and pre-order, by emailing hello@botanicalinks.com. 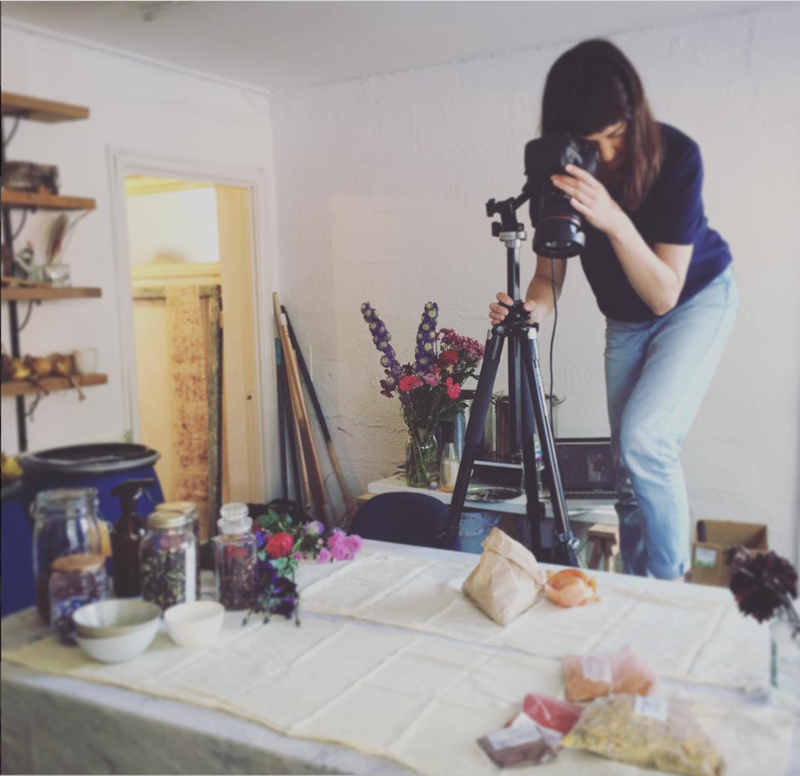 It feels like an age since the Botanical Inks Summer Tour kicked off, back in May, with a series of workshops for Selvedge Magazine. The last one, exploring and de-mystifying, the alchemical art of developing blue hues from plants. Our "Organic Indigo + Shibori class", offers a clean and quick technique for creating this elusive dye colour, and presents some easy Japanese Shibori, fold and bind, resist-printing techniques. It was a total thrill to see the unique works students made in this class. After this, Botanical Inks had a visit from dye master, Aboubakar Fofana, at our rural workspace in North Somerset. We were fascinated to learn from him, about the traditional technique for using a fermentation vat to extract blue dye from actual indigo leaves. For ten days we balanced the dye, using natural lime as our alkaline, and sugar from wheat bran and beer, with the aid of an electric blanket for a consistently warm temperature. After only 8 days, (thanks to our magical Mendip water! ), we were able to dye our first pieces of cloth into brilliant ocean blue shades. We had the task of re-balancing the dye for many weeks after Aboubakar left us, which was an incredible learning opportunity, in the complex, and yet simple, nature of intuitively reading and responding to a living dye. On June 21st we celebrated the Solstice full moon with a land gathering and fireside chatting 'til dawn, here in Somerset. With the days being so long, the hours of dark slipped away without even noticing, before the sun rose again. In July, the Botanical Inks mobile dye + print studio, was up and down the country, visiting all manner of splendid places and people. We enjoyed an incredible day at Babington House in Somerset, foraging flowers and plants from the abundant walled garden. Buddhafields Festival invited me to join their conscious celebrations, sharing the Art of Natural Dyeing with festival goers, using locally foraged plants to colour silk ribbons for adorning floral bouquets and gifts. I enjoyed teaching classes, amongst the busy schedule of meditations, yoga, ecstatic dancing and dharma talks..! It was fun to then to leave the rural retreat of Buddhafields and slink back into the city, to High Road House in Chiswick, where residents learned a fun new way to release tension, while making beautiful botanical imprints on cloth. The Hapazome hammering technique, coined by India Flint, is great for quick and plentiful pattern making. Hauser & Wirth Somerset then hosted an intimate Artist's Workshop for me, at their incredible rural art gallery in Bruton. The day started out with excellent coffee and a walk around the splendid Oudolf Field, designed by, internationally-renowned, Piet Oudolf, from the Netherlands. We marvelled at the landscaping and perennials, enjoying the sunshine and fresh air, before nestling down for a day of mind nourishment and creative inspiration. The first half of the day was spent exploring natural dyes and herbalism. We broke for lunch in the Roth Bar and Grill to indulge in an impressive array of locally sourced seasonal dishes. In the second half of the workshop, we played with organic flowers and plants from Somerset Flower Farm to create some stunning bundle-dyed silks. An enriching group of artists, writers, designers and hobbyists provided a scene full of ideas and opportunities, with new projects and collaborations being borne as a result. At Hawkwood College, we had the pleasure of harvesting our own dye materials from the gardens, to use in class. Leaves were lovingly used as baskets and we returned to the studio with a series of unique flower offerings. Beautiful, and carrying a plethora of therapeutic and symbolic values, these were transformed into the pretty silk prints displayed by the group below. At Port Eliot Festival, we made eco-printed silk napkins, keeping in theme with the foodie vibe. Couldn't leave Cornwall without a trip to this place.. It was super exciting to offer the first Screen Printing With Natural Dyes workshop at East London Printmakers, in Hackney, at the beginning of August. And such a joy to work in a proper print studio surrounded by beautiful old letterpress machines. Thanks again to Hawkwood for providing such a wonderous place for foraging and creativity. Those blissfully green Stroud valley views are medicine for the soul. Here's a pic of me (front right) with the Raised By Feminists Collective, showing off our freshly printed pieces. Looking forward now to more workshops this Autumn! A fun new Experimental Dye Art class at The Saatchi Gallery in Chelsea, London. October 28th. Inspired by Saatchi Gallery artist Sigrid Holmwood, this workshop provides an opportunity to experiment with a range of exciting natural dyes and pigments - from flowers, berries, roots, leaves, insects and minerals. Learn how to use Japanese Shibori tie-dyeing to create resist patterns using simple folding and binding techniques, inject botanical dyes into folds of cloth, scatter fresh and dried flower petals into bundles for steaming to release their colour and create direct impressions on cloth. Learn about the joy of using natural materials to create exciting prints and colour on fabrics. And two more dates at Hamilton House in Bristol. 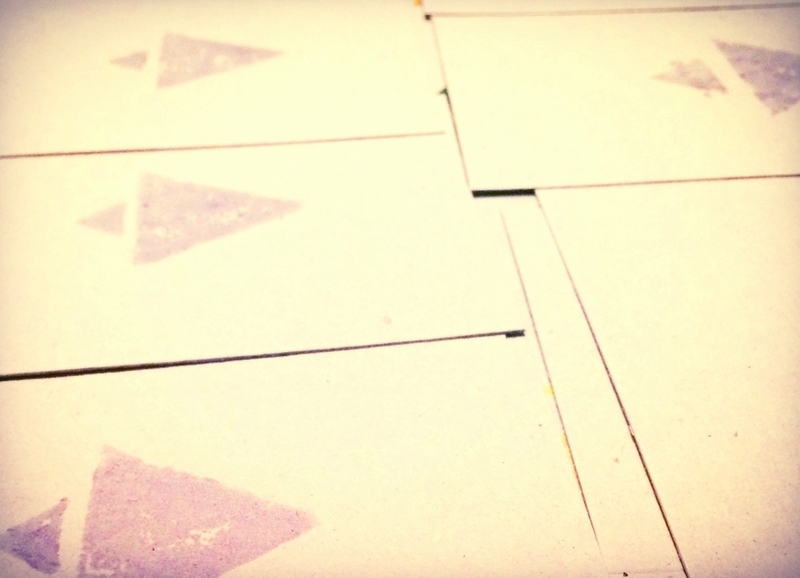 Eco-printing is an awesome, contemporary traditional surface application technique, which allows you to make direct impressions on cloth, without the need for colour extraction or the dye pot. In this class you can learn how to transfer colour from flowers, berries, leaves and waste foods, into beautiful repeat patterns using a simple fold, bind and steam method. Create plant based designs using your own fabric samples, small items of clothing or other textile projects. And take away something beautiful along with the skills to repeat the process for yourself again and again. An exciting opportunity to discover the alchemical process of achieving blue textile colours from plants. Learn about natural indigo vat dyeing and experiment with a variety of traditional Japanese Shibori fold + bind "resist" pattern making techniques to create beauteous blue and white repeat patterns on cloth. The invitation is to bring your own natural fibre textiles, which must be washed in advance and brought to class damp. (There will also be some organic British silk available in class, for you to purchase at an additional cost). You will leave with an understanding of how to prepare your own vat, using a simple 3-step process, how to prepare, process and finish your cloth for lasting results, and use Shibori to make a range of different patterns, along with your own indigo Shibori dyed item to take away with you. So many thanks and blessings to all the lovely people who hosted Botanical Inks this Summer and came to our workshops. It's been utterly lush! Wow!! What a busy time!! It's been non-stop, traveling around England delivering fun workshops this Spring! I’ve been to a plethora of fantastic places, including several Soho Houses and the wonderful Bristol Textile Quarter. It's been a treat to work in these places and meet so many amazing people! Electric House was the first location this Spring and I had a lovely time teaching a small group the art of bundle dyeing with rose petals, calendula and logwood. At Babington House, we had a very pleasant plant identification walk around the gardens, before making some awesome Shibori T-shirts, made with fair-trade organic cotton, using local plant dyes, including onion, eucalyptus and nettle. A week later myself, and my lovely assistant Lauren, were at Soho Works in Shoreditch to teach the same technique again, this time using lengths of organic British Silk. The following week saw us at Bristol Textile Quarter, for the first Selvedge Magazine workshop series, "Bundle Dyeing With Local Flowers". We had a full class, with 14 participants and made a wonderful mess of flower petals, which I had procured from The Flower Shop on Gloucester Road. We loved being in this cool space surrounded by textile machinery and the minimal white backdrop. What a location! I had some time out, to digest all of these wonderful experiences while walking the Exmoor coastal path, among beautiful glowing gorse flowers, then it was back on the road. Next stop Hawkwood College for their Open Day, to talk about bundle dyeing and local flowers. And then on to Soho Farmhouse, in Oxfordshire, for a new one: Hapa-zome printing with flowers and leaves! After this we had our second Selvedge Magazine workshop, this time using Shibori with local plant dyes. I’m thrilled by what everyone made!! It was an utter delight to then offer the first Botanical Inks Hen Party workshop for a beautiful gathering of ladies, in Bristol, in their glorious flower-filled Georgian garden on a sun-filled Saturday afternoon. A dreamy experience which will linger with me for a long time...Picking blooms from the trees and hedges, to throw into silk bundles for steaming, while enjoying a cream tea in the sun...Served by naked butlers…Hah! Such fun! 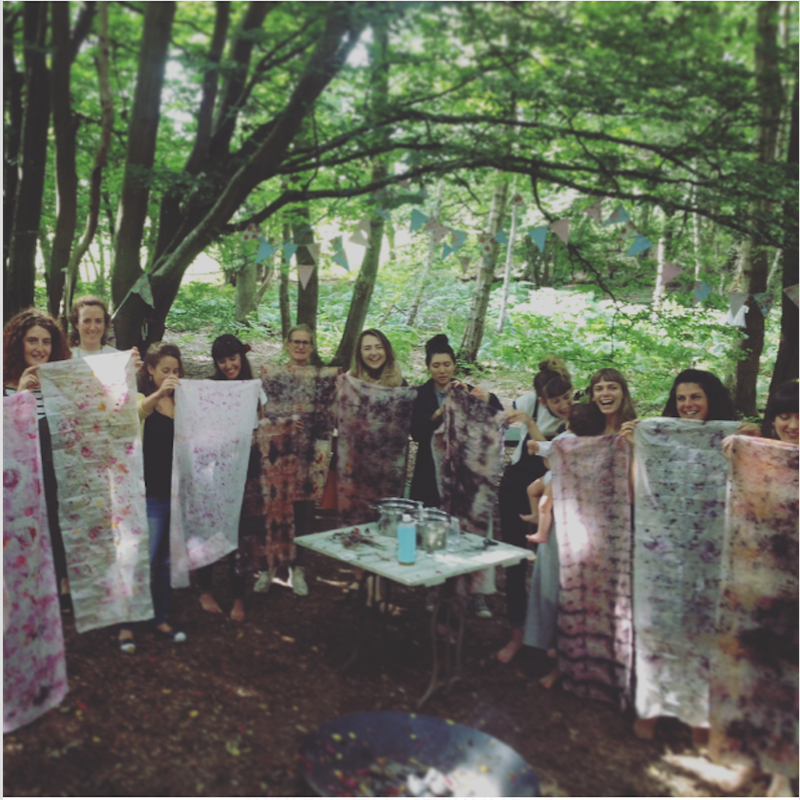 And then we were back at Shoreditch House last weekend, to teach bundle dyeing again! Its been amazing to visit all these incredible places and meet such inspiring and lovely people at every turn! Thank you so much to all of the hosts, who welcomed us in to share these craft skills with their communities. It’s been a total delight..!!! Looking forward to more on our Summer Tour!! Starting next week with our Bristol Walking Festival - Color Foraging Walk in Leigh Woods, on Tuesday 17th. Bookings here. The next Selvedge Magazine Workshop takes place at Bristol Textile Quarter on May 26th, with Organic Indigo Vat Dyeing + Shibori. I'm so looking forward to offering you this new workshop!! Bookings here. We’re visiting The Lammas Project in Wales, June 3+4, to teach field to fabric bundle dyeing: foraging plants from one of the resident’s gardens to make natural mordants and plant dye printed silks. More info here. We then have the great honor of hosting master indigo dyer, Aboubakar Fofana, June 6-17, to teach an intensive 10-day fermented indigo dye course! More info on this here. Look out for more info on the Botanical Inks Summer Tour coming soon! I've been very fortunate to spend the last few weeks in Bali, exploring the vibrant scene of artisan & commercial natural dye studios, factories, farms, gardens and co-operatives. My original intention for this trip was to explore pioneering examples of working commercial dye facilities, to inform my next steps with Botanical Inks. An exciting prospect in itself, however, in the process I have discovered so much more than I could have expected. I've learned a lot from the Threads of Life organization in Ubud, who help relieve rural artisans from poverty by supporting them in finding a commercial market for their traditional textile arts. "Our aim here is to give context to the textiles and fine crafts seen at Threads of Life. Though each object is alluring and beautiful in its own right, it is a material expression of an indigenous culture. Appreciation of an object deepens with our understanding of the intangible culture of values and meanings that its maker sought to express. The object turns from a clever combination of materials into the expression of a personal journey that can touch and inform our lives, too." (William Ingram, Threads Of Life). Textiles here are also valuable tools for particular ceremonies, such as weddings, funerals and teeth filing (a ritual every Balinese person must undergo, in which the 6 upper front teeth are filed down by a priest - each representing one of the 6 weaknesses: anger, jealousy, lust, drunkeness, greed and confusion. Special cloths are hand dyed and woven for these occasions, to wrap specific parts of the body or important religious statues, in preparation for ritual. Its been wonderful to learn more about how natural dyes are used for creating these alluring cloth designs, and of course, inspiring to learn about a widespread use of natural dye practices. The Bebali Foundation, is an incredible resource, having documented over 300 dye plant species across the archipelago, many used to produce minor colors, to manipulate the oiling process chemistry, or vary the shades of the dominant colors. I have been amazed at the range of colour that is possible from just 5 base colours, red, blue, yellow, brown and black, each from a different local plant. I've been working on an exciting project with a commercial dye house to produce a line of organic conscious clothing, suitable for Western cultures, which can be worn for our own rituals: yoga, dance and celebration. More news on this in the coming weeks..! Something that will stay with me from this trip, is the experience of being surrounded by constant daily blessings and ceremonies. 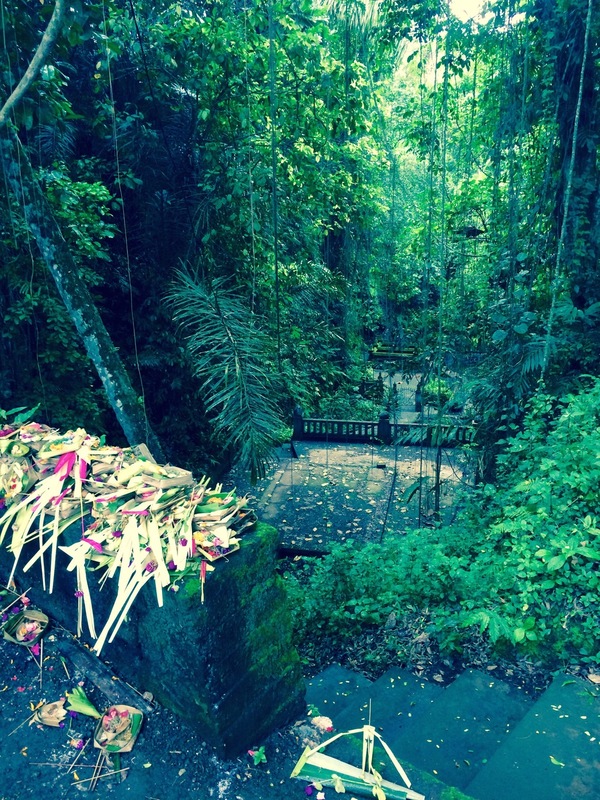 There is an air of sanctity and love in Bali. The smell of incense burning on alters along every street throughout the days, and the local people dressed in their sari's offering blessings to their alters, street, houses, shops, cars...All spaces are continually being blessed which creates a deep sense of presence and feels blissfully lovely! As a botanical and mineral artist, this really has been an inspiring place for deepening my practice and setting intentions for the path ahead. Being surrounded by lush green nature, art, spirituality, wellness and radical self expression in the friendly communities is another thing.. I am very grateful for my time in Bali, for the healing, the inspiration, new visions, people, experiences, practices and clarity that I have been blessed with each day. Its a still & quiet time of year, when moments spent outside feel particularly precious. The careful steps on icy ground; the visible breath lingering on the air. As I've been gathering dye materials, I've enjoyed an awareness of plant life submerged underground, storing its energy in the soil. There's a sense of temporariness in this and the promise of a return to the surface again before too long. I love the grounding effect that this acknowledgement has on my body. Like the soporific sensations of the season's foods and the therapeutic aromas of the pine forest. The slower pace to these cold days brings restoration and opportunity for dreaming. We've just passed Imbolc; the first day of February which marks the start of the annual cycle in Nature. A time of new beginnings, Imbolc reminds us of the return of Spring, only a few more weeks away. The Sun is getting brighter and the Earth warmer. Life is quickening in the soil. I'm acknowledging this turning point, in contemplation and gratitude for the wonderful year that's passed, and all of the blessings that were received. Its been a year since launching Botanical Inks, and what a year it was! The growing community & conversations we are facilitating around clean + local artisan natural dye crafts is so very exciting! And what lovely people you all are! Its been a total pleasure to meet and connect with every single one of you. Now feels like a suitably potent time for visioning and setting intentions for the year ahead. I'm loving the opportunity to put pen to paper and draw up all of my big dreams and clarify my priorities. In terms of the plants we can go to at this time of year, for rituals, recipes and remedies, the resources may seems slimmer than during the warmer months, and it's often surprising that they are actually so plentiful. This month I've harvested windfall eucalyptus leaves and bark, from my driveway. Comfrey, ivy, nettle, dock & dandelion roots, gorse, mahonia and holly from the garden. Onion skins & avocado rinds from the compost. Blackberry surplus stocks from the deep freeze. And a range of waste flowers from local florists. And there are many more options beside from these to be found. We made beautiful colours from many of these seasonal plants earlier in January, in the "Art Of Natural Dyes" workshop at Hamilton House on Bristol's Stokes Croft. In our second January class, we used more local plant dyes to create Shibori resist patterns on a range of natural fibre textiles, with pleasing results. The last of our Winter dye workshops in Bristol, "Bundle Dyeing with Healing Flowers + Plants", closed with a beauteous display of locally foraged wild plants, dried petals & waste flowers from local cafe No.12 Deli and Flower Riot. It was a delight to see the range of gorgeous things being made! I've just spent a gorgeous weekend in Pembrokeshire, with "The Cheerful Project", teaching rural communities to make natural dye inks and to block print their own Christmas cards. We arrived in the dark, in the middle of a howling gale, to friends, Melissa and Rowan's, house, perched on the edge of a cliff overlooking the Pembrokeshire coast. I love the surprise of waking up somewhere new in the morning to find out where you are. The journey to our class took us down beautiful twisting, winding, wintery country roads, through little welsh hamlets and farms. The light drizzle and open landscape nourishing the adventure. Saturday was for making dyes from plants I had foraged and brought with me. We reduced them down and mixed them together with binders and preservatives to create non-toxic and biodegradable inks. On Sunday we used our inks to experiment with the block-printing process, using biodegradable vegetable blocks and recycled paper from a mill in Lancashire. We made some lovely colours from a mixture of berries, plum, eucalyptus, dock, yew, onion skins and logwood. It was really special to meet the people who came to share this time together with us. We had such an interesting mix of folk, from local villages, small holdings and a land-based communities. Among the group was a lady who grew her own dye plants, another who taught science and used cabbage dyes in ph tests, some were artists, lino and screen printers, textile artists and sustainable living enthusiasts. It was such a rich and diverse gathering of personalities and talents. And fascinating to see how different people used the medium to create such a variety of styles. On the last three Thursdays of January 2016 Botanical Inks will be hosting dye workshops at CoExist, Hamilton House, in Stokes Croft, Bristol. There will be three to try, and you can choose to do one or all: native dyes/ shibori/ bundle dye. This week has been all about block-printing with natural dyes on paper! I've been carving up little geometric printing blocks from root vegetables and apples, and using surplus berry supplies from the Autumn, with potato starch, to create food-grade printing inks. Blackberry, red currant and black currant inks. They make cute prints on the soft background of this locally made, recycled paper from Eco-Craft. These guys are going to go to the Coexist Winter Emporium, where they will be available to buy throughout December.